Olot, a small people to the north of Gerona, is surrounded by a volcanic nature reserve by thick forests of centenary oaks. 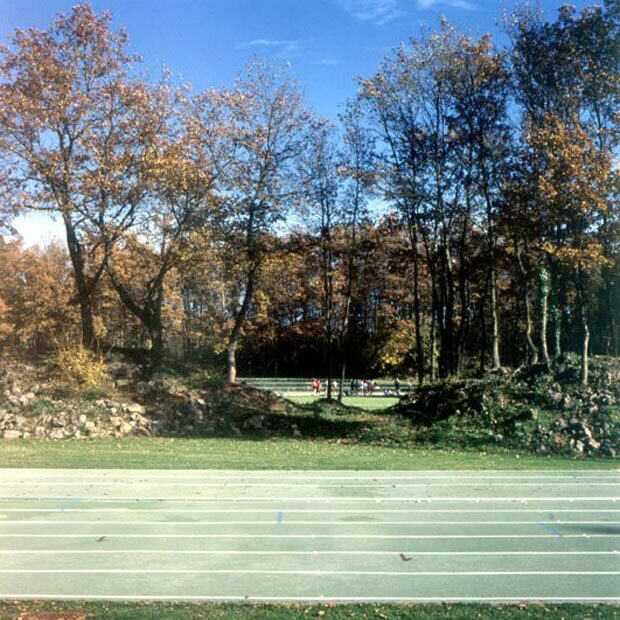 Due to an urban development planning written in a nearby past that still was not contemplating environmental criteria, there was foreseen the construction of a stadium of athletics inside the mass of oaks whitly, a species of very slow growth. It does little more than one decade, this offer managed to generate a conflict between the Federation of Sports and the interests of the ecologists. Some were demanding a few tracks of athletics in that the judges of career did not have restriction of conference because of the trees, while others were fighting against the felling oak. On the other hand, of not following the regulations, the Federation would not recognize the competitions there organized. Before this situation the town hall asked the equipment of architects RCR for a project that it was playing the role of a mediator between both parts. Instead of beginning to negotiate, and before drawing some line, the equipment of architects RCR (Rafael Aranda, Carme Pigem and Ramon Vilalta) investigated on the human conduct in relation with the athletics. For it they went back directly to the constitution of the Games in the former Greece. The first information of the Olympics is of 776 B.C., when Zeus was organized in Olimpia as honoring, and shows that the games were celebrated in the nature. Since then and up to the decree of the emperor Teodosio I Big, when, in 394 A.D. his celebration was abolished, the Olympics were characterized by a dual character between the religion and the physical health. .
RCR recovered the origin of the games in the nature and proposed it as contemporary scene for the athletics and the social meeting. His first task was therefore to look for the place that could establish a dialog between both papers designated to the stadium of athletics: how to create an environment where nature and sport could not be separated. 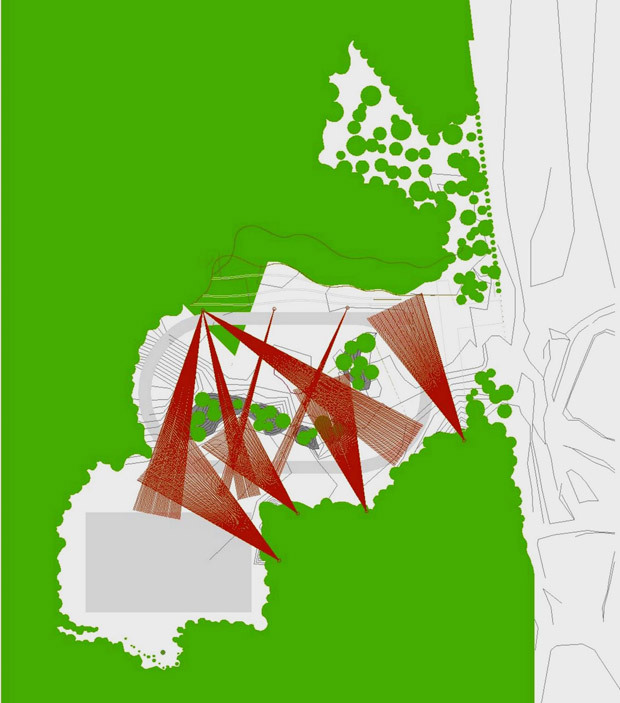 The location of the project proposed in the clear one of the forest that it was corresponding to two former fields of culture. 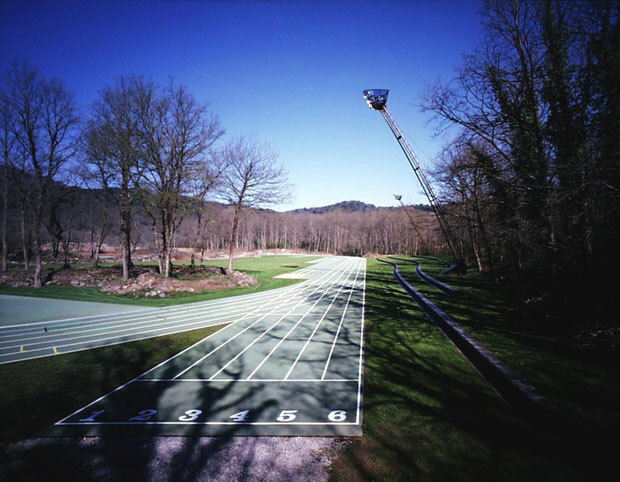 Though both were separated by a vegetable mass, the total surface was sufficiently wide to accommodate a ring of 400 meters with six tracks and the attached facilities for the practice of athletics. If, a priori, this program was deferring enough of the environmental recoveries, one managed to plan the tracks respecting the oaks simultaneously of expiring with the strict federative controls on the visibility of the tracks. 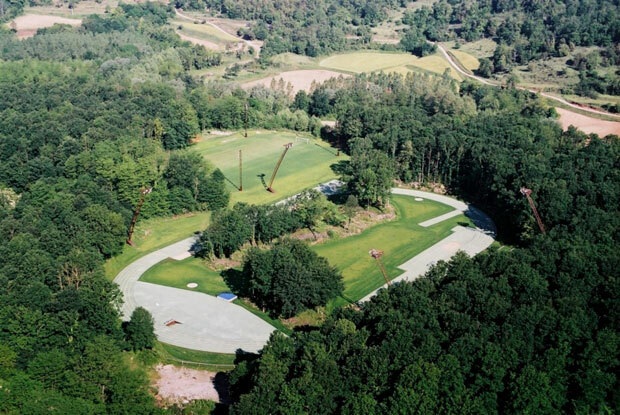 In spite of the trees, the judges can observe correctly the exits and arrivals of the different competitions, with which all the careers are supervised. On the other hand, on having seen the athletes appearing and disappearing between the trees an amusement is added between the spectators that it increases the suspense. The game of appearing and disappearing already is present from the same moment in the one that comes near to the forest and one leaves the vehicle. Without still seeing the stadium, the way towards place leads the visitor, introducing it across the sight, ear, smell and tact, in an act that prepares us for an unusual scene. The spectators are sat in a few steps realized as small banks, with blocks of concrete color basalt, which small bench-covers seem to shape between the clear ones. A few high towers of lighting act as elements that converse with the trees and establish references in the space. While, a small element of iron despliega to accommodate a bar and store. 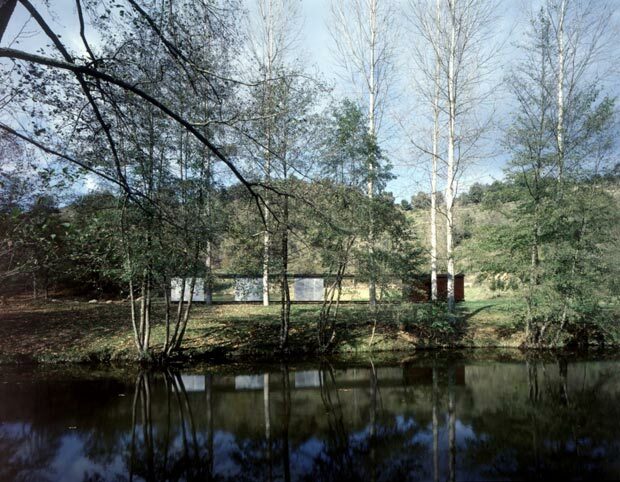 The forest already is a place where the spectators can enjoy so much as the sportsmen, looking at the practice of the athletics and the competition, or even wallowing in the river Fluvia, close to the pavilion of bath designed by the same architects. This one is another simple metal framework and steel, with a small bar, wardrobes and, between them, a great porch that allows the trees to form a part of the front. The forest does that the space of the track could perceive and this is, precisely, the element that has directed the process of design of the project. Which is here the limit between the natural thing and the artificial thing? The spectator cannot give a precise response, but it can feel that he identifies with the place, looking at the trainings and the competitions in the nature, or coming with the family to enjoy the tracks between the oaks. The trees also take part, play with the wind, change according to the stations, his lobuladas manage to lose leaves of silver back, and, at the beginning of October, fill the tracks of acorns. The forest does that the space of The old oaks they have been the materials of construction used in this project and, with them, there has been created a new reality that harmonizes the environmental and sports vision of his visitors.